to love you and care for you. Hi Max! Happy Dog of the Day to you! What an adorable Shih Tzu boy you are, Max, just as chill and laid back as they come, truly living the good life there in beautiful Ellsworth, Maine, with your devoted, doting Mom and Dad and fur sis Milley! Ahh, life is good, that's for sure, though it wasn't always so! Looking at your beautiful, healthy, smiling self it's hard to imagine you were once that neglected, matted and flea ridden boy your Mom describes. Thank goodness your former family had the good sense to rehome you, and the rest is happy history! Endless thanks to your Mom and Dad for opening up their home and hearts to one most deserving boy! They might not have thought they were fans of small dogs, but that was before they met you! How lucky they are, having a furkid as sweet and loving as you, Max! In body and heart, inside and out, you're as special as they come! Thanks for the BIG smiles, cutie pie! Meeting you today, being treated to your utterly heart-melting photos, has been a joy! I hope you're enjoying a very special day of celebration, Max...swinging by the Crystal Clear Pet Store, loading up the cart hehe; spending some fun time outdoors, playing with sister Milley; cuddling on the couch with your Mom and Dad, watching a little TV; being loved and pampered to pieces! Lots of love, cuddles and kisses to you, precious Max, our very special and most deserving Dog of the Day, EVERY day! Love to dear "big" sister Milley, too! Dearest Max, you are adorable! What a sweet Shih Tzu you are, absolutely adorable in those great photos. And what a terrific story you have to tell! Your dear people came along and rescued you from a family with too many dogs for them to take care of properly. We're so sorry to read of the sorry state you were in then, but with loads of good care and tasty food and true love you eventually regained good health. Now you live the delightful life you deserve and always have! You and your BIG sister Miley (somehow we bet you're not litter-mates!) have a great time playing tug of war together. You enjoy car rides and going for long walks at night down to the river. You and your dear people and Miley all love each other very much, don't you. What a wonderful love-filled home you share! 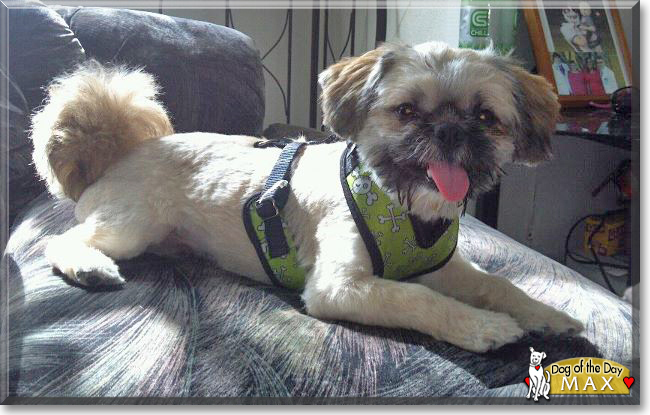 Congratulations, darling Max, on being chosen today's Dog of the Day! We hope you and your dear people and Miley and all your family and friends are enjoying a fine celebration, full of fun and lovies and all your favorite games and treats, maybe even a special visit to the Crystal Clear Pet Store! Last edited by phesina; 01-28-2019 at 04:34 AM. Max is certainly wonderful! He is so healthy, safe and happy now, hurrrray! Of course he is adorable, unbearably sweet and special too! Congratulations on being today's Dog of the Day, adorable Max!